After several years of reorganizations brought on by prolonged declines in demand, industry suppliers are increasingly eager—and able—to demonstrate what they can do for customers. As upstream activity begins to accelerate, spurred on by stronger commodity prices and growing rig counts, oil and gas industry suppliers are increasingly focused on providing customers with experiences designed to encourage greater long-term loyalty in a highly competitive environment, according to results from EnergyPoint Research’s latest Oilfield Products & Services Customer Satisfaction Survey. Now in its fourteenth year, EnergyPoint’s closely followed independent survey is the only annual study focused on customers’ satisfaction with suppliers across a full range of upstream products and services. The survey, which was concluded at the end of 2017, measured the customer satisfaction of oil and gas industry suppliers across a variety of attributes, categories and regions. Top overall ratings were awarded to the following companies in each of the four major upstream oil and gas segments covered in the survey: Helmerich & Payne in onshore contract drilling; Ensco plc in offshore contract drilling, reservoir and production specialist Core Laboratories in oilfield services, and; solids-control equipment manufacturer Derrick Equipment in oilfield products. Helmerich & Payne repeated as the top-rated onshore contract driller in this year’s survey. In addition to rating first in total satisfaction, the company took top honors in performance and reliability, safety and environmental (HSE), technology, Onshore Gulf Coast, Interior Texas & Mid-continent, horizontal and directional applications, shale-oriented applications, and three additional categories. Precision Drilling in job quality, Canada, and U.S. Rockies & Dakotas. Among offshore contract drillers, Ensco once again placed first in total satisfaction. The company also rated first in terms of job quality, safety and environmental (HSE), performance and reliability, technology, deepwater applications, the North Sea, special applications, and four additional categories. Seadrill in Asia & Pacific Rim and harsh-environment applications. In the oilfield products segment, Derrick Equipment rated first in total satisfaction. Derrick also rated first in several additional categories, including solids control equipment, rig-related equipment, engineering and design, availability and delivery, and two additional categories. Weatherford International in sand-control equipment. Core Laboratories repeated as the top-rated oilfield services provider in the survey. In addition to total satisfaction, the company placed first in core and fluids analysis, formation and well evaluation, job quality, onshore applications, U.S. & Canada, Middle East & N. Africa, Asia & Pacific Rim, and five additional categories. Weatherford International in directional drilling, sand control services, and Middle East & N. Africa. 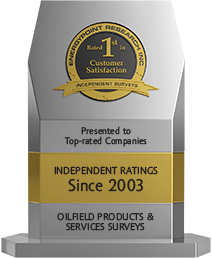 EnergyPoint’s closely followed oilfield product and services survey, which is conducted annually since 2003, is the only study of its kind focused on the oil and gas industry’s satisfaction with upstream suppliers. As part of the survey process, qualified respondents evaluate suppliers in four segments: oilfield services, oilfield products, onshore contract drilling and offshore contract drilling. For the survey, suppliers were evaluated in various areas such as total satisfaction, pricing and contract terms, performance and reliability, technology, engineering and design, job quality, safety and environmental, service and professionalism, post-sale support and corporate capabilities. Additionally, suppliers were evaluated across multiple product and service segments, well types and applications, as well as domestic and international regions. More than 120 suppliers received the minimum number of evaluations needed to be considered for EnergyPoint’s 2017 rankings. For those suppliers and categories in which ratings exist, scores from the 2014-2015 survey period were included in this year's category-winner calculations at lesser weightings than for the 2016-2017 period. In no case were 2014-2015 ratings assigned a weighting of more than 20 percent for purposes of calculating final winners. 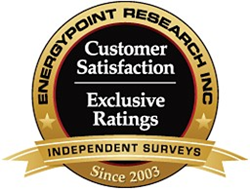 For more information concerning EnergyPoint Research, its independent surveys or suite of research products and services, visit the company’s web site at http://www.energypointresearch.com or contact the firm at info@energypointresearch.com or +1.713.529.9450. To learn about promotional programs and rules related to EnergyPoint’s surveys, visit the firm’s Licensing & Promotions Policy at http://www.energypointresearch.com/licensing.html. EnergyPoint Research provides independent research regarding the customer satisfaction of suppliers of products and services to the energy industry. Founded in 2003, the firm publishes annual customer satisfaction ratings and rankings in six industry segments, including: onshore drilling, offshore drilling, oilfield services, oilfield products, midstream services and gasoline retailers.